My back garden August. 2010. 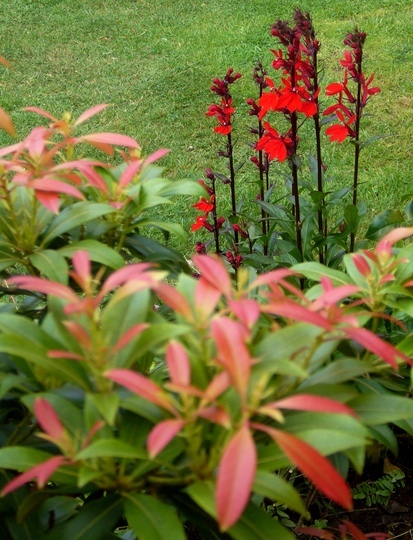 Pieris Forest Flame and Lobelia. A brilliant photo, looks lovely. Simply red and simply stunning ! Oh my word, this is a brilliant combination. Vibrant red against the grass. Some like it hot lol lovely photo of reds. Lovely combination TT, I love lobelia and looks good with the pieris. Lovely bright sunny colours and I'm glad your grass is green again !! height, texture, colour ~ what more could one want? i like surprises like that!